On this day I arrived in Brussels. The Eurostar train was amazingly easy and very fast, taking me directly to the Gare Midi train station fifteen minutes from the hostel in which I was to spend the two weeks with the Brussels School of International Studies. The area around the station is underwhelming but this does not reflect the beautiful and exciting Brussels that I came to know. My early arrival meant that I had a few hours to kill and so, after dropping my luggage off at the hostel and being impressed by its design and facilities, I went out looking for the kind of exhibition or museum which a cultural hub like Brussels offers. I was not disappointed and very quickly found Le Botanique, a cultural centre inside a stunning piece of greenhouse style architecture. Upon venturing inside I found a photography exhibition displaying images taken by Josef Koudelka during the invasion of Prague by the Warsaw Pact states in 1968. The black and white stills were a haunting reminder of the ability of states to inflict suffering on each other during times of conflict. This lucky find struck me as significant in understanding the European Project not only because of the evident need for states to co-operate but also because of the ability of Europe to now offer protection and security in the face of an unpredictable Russia. Being able to reflect upon the nasty face of a divided Europe was a useful prelude to the two-week University of Kent Summer School in which I would attempt to understand the inner workings of a complex and vital union. Later in the evening, after meeting and forming a friendship with my roommate, I headed into the centre of Brussels for drinks with all the programme attendees and the Head of European Administration. The Café Georgette provided a perfect site for forming early bonds with the people who would make my experience so special and finding out a lot about the Brussels School of International Studies and the programme from Alastair Ross. From the café I, along with a group of people who would become close friends, set off to explore the main highlights of Brussels, the nightlife and the great beer, before heading back to the hostel to prepare for our induction the following day. The journey to the University on the first morning was effortless as the group and I were accompanied by a representative from the school who was helpful and informative. We had two sessions with the Academic Director Dr Amanda Klekowski Von Koppenfels. The first of these was a broad introduction to the establishment, development and institutional composition of the EU including references to important figures and dates. This was very useful in giving an understanding of what the EU is and why it is important that it continues to function effectively. This broad introduction meant that we could take part in the more specialised lectures later in the week. The second lecture was an engaging discussion on migration where the lecturer debunked a series of myths surrounding migration and gave a comprehensive introduction into what migration means for the future of Europe. The sessions were broken up with a lunch in the university consisting of delicious sandwiches and desserts. Fortunately, our time in Brussels coincided with The World Cup and so with our free evening as a group we decided to go to a popular bar called Roosters near the Grand Place to watch the England vs Tunisia game. The first half of this day was spent in the European Parliament where we had a chance to briefly see the interior of this important building and the hemicycle (debate chamber). The highlight of this experience however was the opportunity to meet with and hear an insightful account of life in the parliament from both a member of the parliament’s civil service and the MEP for the South East of England Richard Ashworth. It is opportunities like this to see the working side of the EU which makes the programme more than simply a series of fascinating lectures but a useful experience like no other. After the Parliament our group paid a visit to the Parlamentarium. This is the Parliament’s visitor centre which contains an exhibition dedicated to the history of the European Union and the various beneficial programmes which are in operation across Europe and its neighbouring countries today. The dominating narrative amongst many mainstream media organisations is that the EU is fundamentally a superfluous body struggling to make progress. It is only by going to the heart of the decision-making body that the subversion of this narrative is possible. The Parlamentarium is a testament to the EU’s progress and ability to drive the continent forward in vital areas like green energy and environmentalism, peace, and the basic freedom to live and work in 28 states as one chooses. The entirety of Thursday was dedicated to a careers workshop which taught the group the vital skills necessary to find the kind of jobs which really suit them, where to look for opportunities, how to make it to the interview stage, how to perform well in an interview and practical advice on perfecting CVs and covering letters. From this workshop I acquired the confidence to tackle a complex and competitive job market and to begin thinking seriously about my plans after graduation without stress or confusion. I have heard personally from an attendee of the course that this session was so beneficial for improving her CV that she received an interview almost immediately upon returning for a dream job. She also feels confident in her ability to do well in the interview because of the training received. The trip to Mons was the highlight of the entire trip because it combined the opportunity to see and learn about places of genuine historical and political significance, to visit places beyond the city of Brussels and most significantly to explore some places of beauty which I would otherwise not have seen. Our engaging tour leaders were Dr Michael Palo and Martine Delsemme. The background information required to make the most of the trip was given in two parts. Firstly, by a lecture given by the tour leaders days before and secondly by watching documentaries about the importance of the First World War on the coach on the way to the St Symphorien Military Cemetery. The significance of the Cemetery itself was described by the tour leaders as it contains the first and last commonwealth soldiers to be killed in the war. The site is a beautiful and humbling place which, whilst it is well kept and peaceful, is a reminder of the great costs of choosing conflict over co-operation. The next stop on the tour was the Mons Memorial Museum. The museum’s remit is to encourage reflection and dialogue around the first great tragedy of the 20th Century and so whilst it is deeply historical it brings personal stories and tragedies to the forefront of the visitor’s conscience. The final stop was the stunning Chateau De Pierrefonds. Described by our guides as a real-life Disneyland, the beauty and elaborate design of this castle did not disappoint any of us. It provided a great opportunity for photographs and a relaxing way to end a day which had a very heavy focus on the darker events of the past. The story of the castle is that it was destroyed by conflict and from the ruin something far more beautiful and stable was born, this is an excellent metaphor to sum up the goal of European nations after the ravages of two great wars. The weekend gave us an opportunity to choose freely how we wanted to spend our days. Some people opted to visit nearby cities like Bruges whilst I opted to stay within Brussels to see some more of the sights. I woke early on the Saturday and a small group of us decided to see the Fine Arts Gallery. The works of art contained in this relatively small space range from Bruegel to Fabre and together constitute an impressive and diverse collection. After tackling the more serious topics of the week I felt it was useful for me to relax and the beautiful art on display definitely helped in this endeavour. After this we paid a visit to the Bois De La Cambre which is a forest and a must see for all visitors. It is very surreal to one minute to feel as though you are walking through a vast metropolis and the next to be breathing in the fresh air of a forest which feels as though it is in the middle of the countryside. The two sessions that took place on this day were incredibly insightful and able to debunk many of the myths and inaccuracies around two complex subjects. Speaking with a representative of the British Foreign Office about the process of Britain exiting the European Union gave students a chance to cut through many of the complexities of the process and the misinformation propagated by large parts of the media sphere. I left feeling I had acquired a sober understanding of a divisive topic. Another topic which has been at the forefront of European debate and politics is the perceived conflict between the existence of Islam in Europe and Europe’s supposedly liberal values. Dr. Azmanova is an excellent lecturer with the ability to cut through an emotional and contentious subject in a logical and well-constructed way. The setup of the lecture was based on the Charlie Hebdo incident in France and the students were taken step-by-step through this case study from several different perspectives including the historical relationship between France and religion as well as the reactions to the event. The debate which resulted from this lecture was incredibly interesting with strong opinions on both sides leading the discussion forward. The next few days continued in a similar vein as before with some fascinating lectures on subjects ranging from climate change to integration and populist politics. The opportunity to discuss serious politics topics in a room full of engaged and knowledgeable people is a rare and enjoyable opportunity for me to hone my debating skills and learn from others with different views. The lecturers facilitating these sessions included the inspirational Dr Azmanova and two excellent guest lecturers from the Free University of Brussels. The evenings were often spent in large groups of us students trying to explore the final parts of Brussels as the sad time we would have to go home loomed. The Molenbeek district offers amazing restaurants and the centre is full of lively bars which we knew like the back of our hand by the end of the two weeks. The chance to switch roles was given to us on the final day where we, in small groups, gave presentations on the future of the European Union in the area which interested us the most. A highlight for me was to hear one group speak in detail about how European identity is likely to develop going forward. My group focused on the likely progression of migration policy in the European Union. By focusing on two case studies to assess the most successful way to move beyond the current crisis. Sweden demonstrates the benefits of having strong integration policies for society and the economy. Poland on the other hand with its policy of non-acceptance of migrants was shown to be damaging its own economy because of its ageing population and lack of young and well-trained workers. After the presentations finished we had a final lunch with the lecturers and students and were able to say thank you and goodbye to some of the people we had met over the past weeks. An award was given for the group who gave the best presentation. The evening dinner was provided as a final farewell in the Vert de Gris. The food and wine were both incredible and acted as a great start to our final night out. 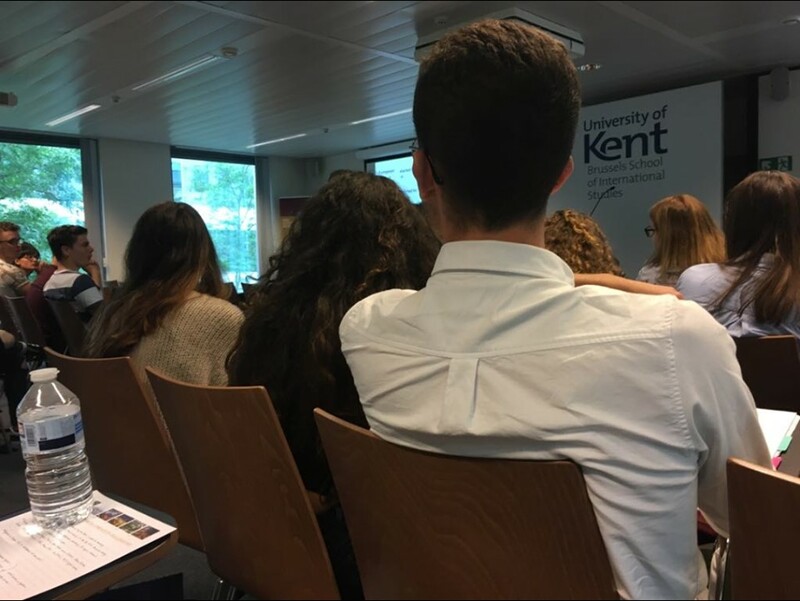 Looking back over the two weeks I spent in Brussels with the University of Kent Summer School from the UK I feel incredibly happy that I had the opportunity to learn so much about and pro-actively engage in topics which have fascinated me for a long time. Not only did I meet a host of incredible people who I know I will stay in touch with and look forward to seeing again, I was able to explore and feel at home in a lively and diverse city. I now have a comprehensive understanding of the inner workings of the European Union and have a clear understanding of Europe’s place in the world, now and in the future. I feel confident that my experience will help guide me through the rest of my bachelor’s and give me the confidence and opportunity to succeed in professional roles afterwards.